This 18" diamond heart necklace in 14K white gold from Apples of Gold Jewelry will make her feel like the most loved lady in your life! The necklace, which features an open-cut heart pendant, which measures 1/2 inch in size, is made from 14K white gold with sixteen diamonds, which total 0.25 carats (1/4 carat), and are rated H+ for color and I1 for clarity. The sparkling diamonds on the heart pendant really add sparkle to the necklace, which is the perfect gift for the one you love! 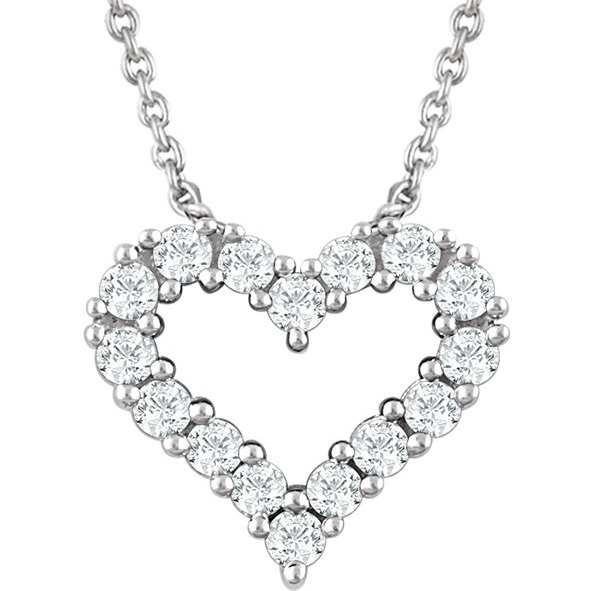 We guarantee our 18" Diamond Heart Necklace in 14K White Gold to be high quality, authentic jewelry, as described above.